W-LU GOC_4th Canadian Armoured Division (Canadian Army PA211629_jpeg) This appears to the the same jeep as in the colour photo above, just after it was customized for the General Officer Commanding 4 Canadian Armoured Division. They added roof, doors, flag staff and light and extension on rear of vehicle. It is carrying at least one wireless set. As long as there have been military vehicles – which admittedly are often identical to thousands of other such vehicles, there have been markings. The markings serve not only to identify a particular vehicle, but also to identify the unit and formation that it was serving in. This page will be developed over time and the emphasis will be on CANADIAN military vehicle markings and paint schemes from all periods. This will include markings painted on vehicles, transfers (decals) which came out during WWII which speeded up the process, vehicle flags and licence plates etc. This is an aspect of our history that is often little understood and in a restored military vehicle, makes all the difference if done well, or badly. I always hate to see a vehicle that an owner has spent sometime over $10,000 and years restoring, and seeing them put incorrect markings on, or put on ‘correct’ markings in a wrong fashion. After military service, most vehicles are repainted, and even those that survive in original paint jobs often have the markings painted out by the military before being sold surplus. Most of the time these markings are lost forever. If you have an old military vehicle, remember that its history is usually in the MARKINGS. Too many collectors have sandblasted a vehicle and then asked what the history of their vehicle was. The military forces of the world usually destroy army vehicle records. Some fortunate exceptions are the British Army (post-war) and the US Navy (which also covered the US Marine Corps). How did they put the markings on? At first, they were all stencilled or hand painted by a sign-painter. Each unit tended to have a sign-painter, sometimes someone who had been a sign painter in civilian life. The Seaforth Highlanders of Canada had one, and Doug Lunn was one for a Canadian General Hospital overseas. Doug gave me a set of his brass stencils for letters/numbers, 4″ high, and many were C/|\ marked. He told me that he would take a string, rub it in chalk, then place it along to bottom (?) of the place he was to paint the numbers. He would then snap the line to deposit a chalk line on the door of the truck. He took the brass stencils, and slid them together. His white paint was very thick to prevent runs. He took a stencil brush and stippled (dabbed). He told me that closed cell foam (e.g. army sleeping pads today) work well in lieu of a stencil brush. Here is an article from the 1945 POPULAR MECHANICS SHOP NOTES which illustrates a similar procedure. Sign painting on trucks in 1945 from Popular Mechanics Shop Notes. Civilian, but the technology was the same. 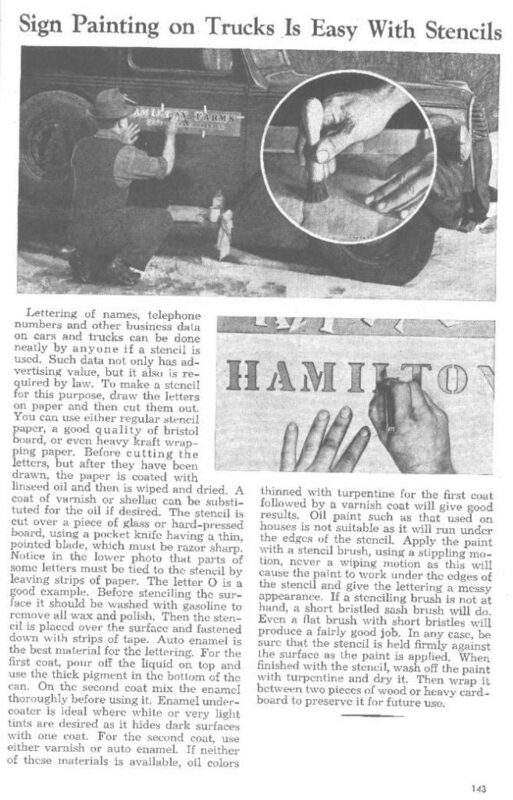 How to paint stencils on trucks, 1945. Although it is civilian, it shows the technique of the day. By 1944, transfers (water based decals) were being made and issued for marking vehicles. The decals were for the formation signs, and for background colours for unit signs. This saved many hours of work and greatly improved the quality. After WWII, peel and stick decals came into use. 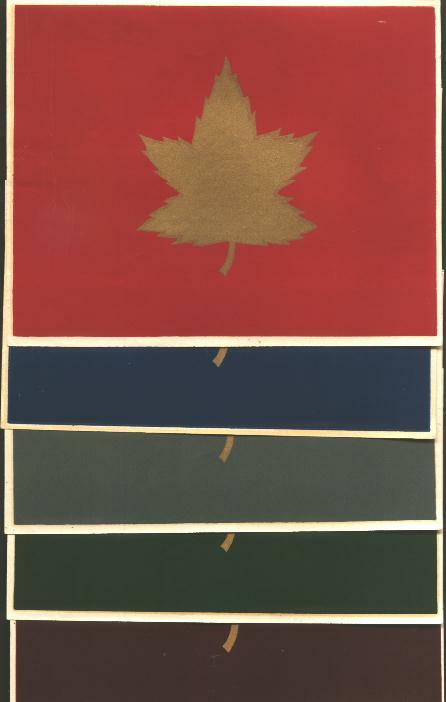 1 Canadian Infantry Division formation sign. Peel and stick decal from after WWII. World War II Canadian Divisional Formation Signs. Top to bottom: 1 Cdn Inf Div; 2 Cdn Inf Div; 3 Cdn Inf Div; 4 Cdn Armd Div & 5 Cdn Armd Div. 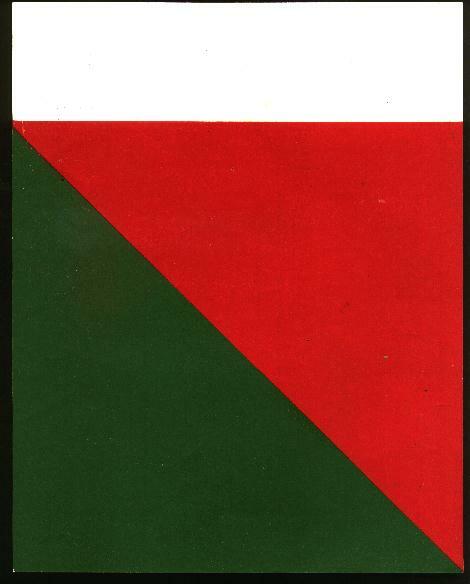 Royal Army Service Corps and Royal Canadian Army Service Corps World War II formation sign decal from the 1944-45 period. Royal Canadian Army Service Corps. The abbreviated title of the unit would be painted or stencilled on the white strip. 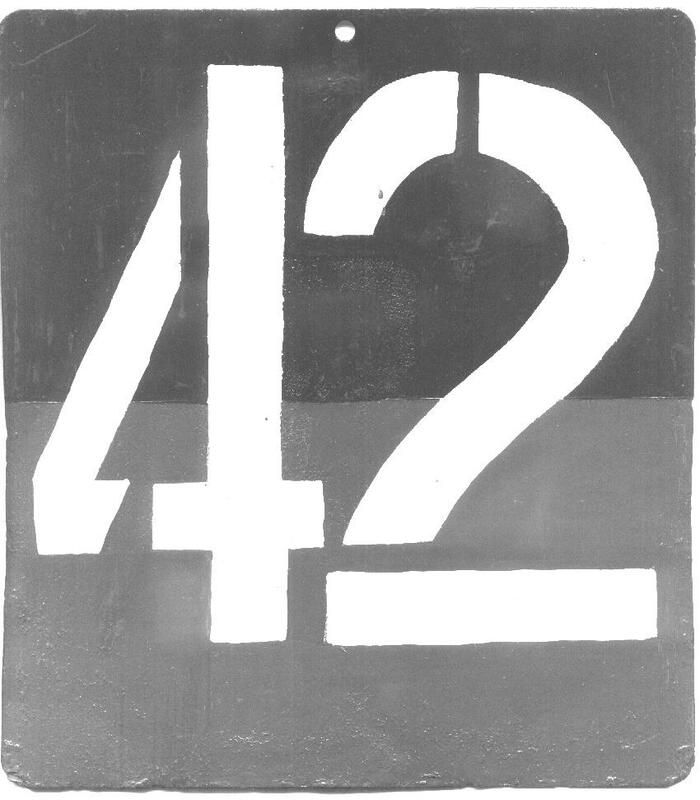 1944-1945 decal for 21 Army Group. War Department number (e.g. 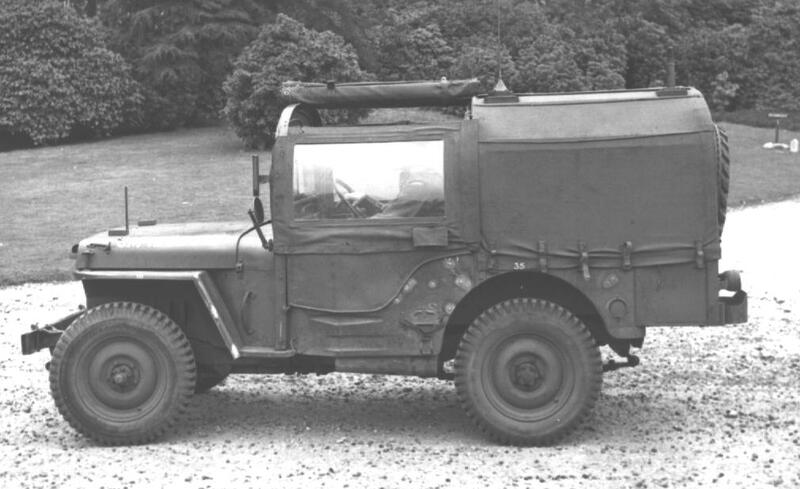 CM4242313 was on General Crerar’s jeep in June 1944). This was the military’s control number and once assigned, they rarely used the vehicle serial number (today we call it a VIN – vehicle identification number). Bridge sign – This was usually a black number on a yellow circle – solid or outline circle – which listed the approximate weight of the vehicle in tons. Jeeps may be seen with the number 1, 2 or even 5. If the vehicle was a towing vehicle, there could be two weights – one for the solo vehicle, and one with the towed load. The purpose was so that guards on bridges could stop traffic that was too heavy for their bridge. Tire pressure – Usually just a number over the wheel wells, or a longer code. Often painted on the inside of the cab. NOT the US style “TP…” marking. Gas detection patch – A mustard yellow irregular blob of paint on a surface visible to the driver. Air recognition signs – To keep from being shot at by one’s own forces or allies, many vehicles had recognition signs painted on them. In 1942-44, the British used the RAF roundel on the upper surface e. g. the hood (bonnet to British readers). 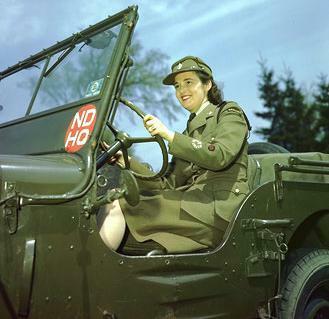 Name – Some British (and US drivers) named their vehicles, usually after girlfriends, though this was not common in the Canadian Army except in the Canadian Armoured Corps for tanks. 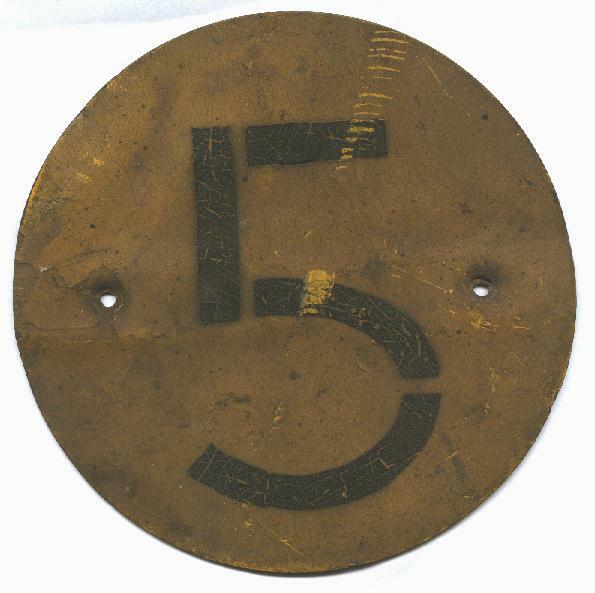 Original WWII Canadian Bridge Sign with number 5. This was off of a 15 Cwt. truck. Vehicle Bridge Sign – New Old Stock British post-WWII. A black number would be painted on or possibly applied by decal. New old stock British Army Bridge sign with original packing label. This is a post-WWII manufacture, but is very like (or identical) to a WWII style. Colin Stevens’ former Willys MB (1944 SN VDN-1121, ex-Norway) painted up as per Royal Canadian Air Force, Tactical Air Force in Normandy, 1944. Michael Desmazes in an original WWII RCAF uniform is standing in it. 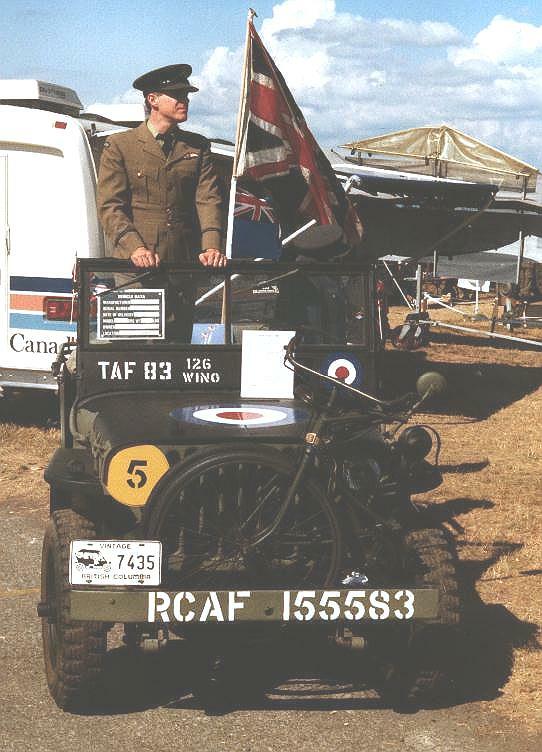 Colin Stevens’ Willys MB (ex-Norway, ex-UK) in RCAF tactical Air Force markings with bridge sign. The man shown is Dr. Hugh Morse, a Spitfire pilot with an RCAF in WWII (he flew combat in the Aleutian Islands and Normandy and anti-V1 Buzz Bombs over the UK). I have since repainted this jeep back into army markings. Canadian Sherman tank named BOMB. It survived from D-Day to the end of the war. 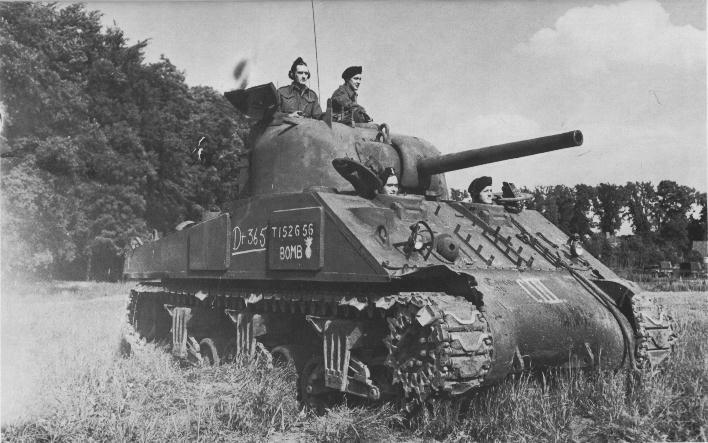 “Bomb”, a Sherman tank that served with the Canadian Army from D-Day through to the end of the war in Europe – shown here on June 6 1945 presumably – one year (365 days) after D-Day which was on June 6, 1944. Early WWII PASS plate and Unit Sign holder, Canadian Army. Author’s collection. Early WWII unit and formation signs were painted on metal plates which slipped into a metal frame attached to front and rear of vehicle. – Colin Stevens’ collection. PASS plate/Unit Sign. The unit sign side was repainted by Dennis Cardy in the 1970s. 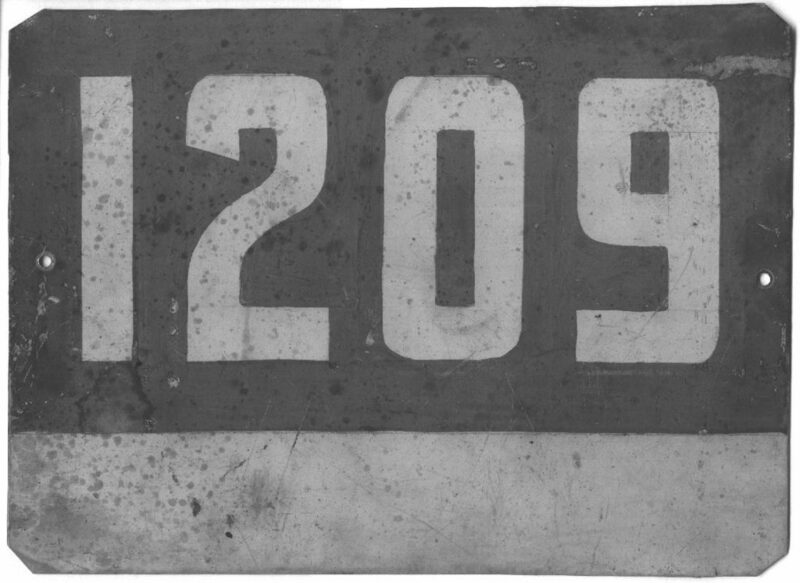 Original early WWII Unit sign/PASS plate. This one was repainted on the unit sign side in the 1970s by an owner. On pack of plate is word PASS in white on the khaki paint. An original WWII Unit Sign brought back by a Canadian solider. Shown here in Black and white. Author’s collection. 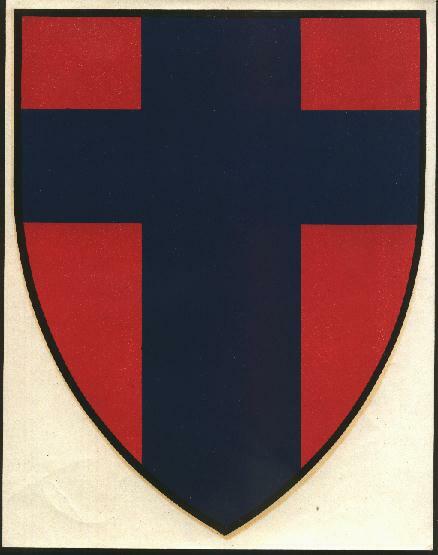 Original WWII unit sign. Brought back by a veteran who served with a transport unit of First Canadian Army overseas. Shown here in B&W but is actually colour. Painted on aluminum. – Colin Stevens’ collection. 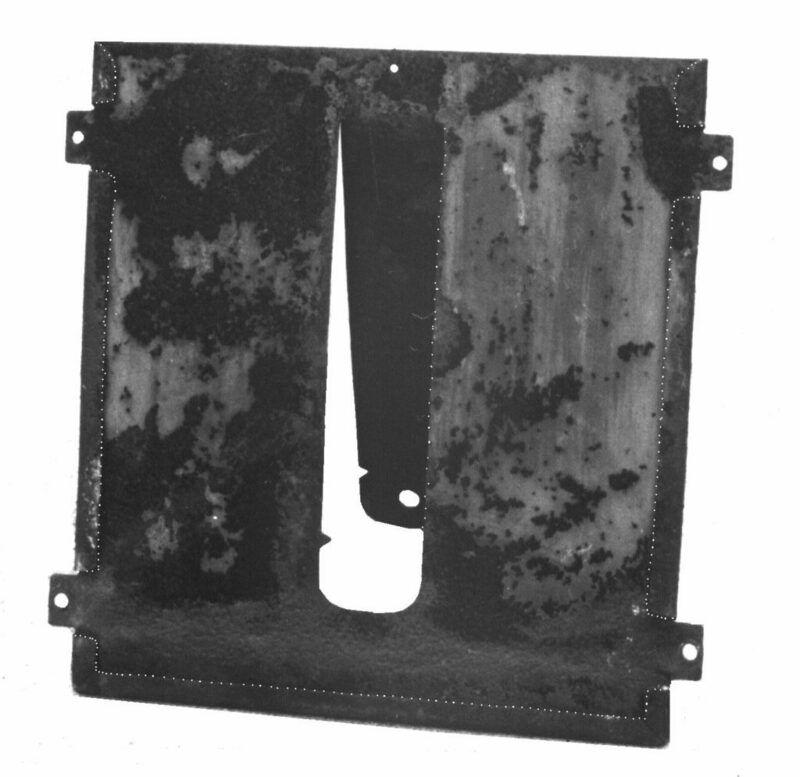 This specimen was used and has the mounting holes drilled. Early formation signs were hand painted and/or stencilled. British 79th Armoured Division. All of the odd armoured vehicles were placed under this formation. The Canadian Kangaroo Armoured Carrier Regiment was in 79 Armd. Div. The Argyle and Sutherland Highlanders were part of the 4th Canadian Armoured Division. Our D-Day division was 3rd Cdn Inf Div. The 4th CAD arrived in France in the second half of July 1944, going into the line at the end of the month. They were part of II Canadian Corps. 1. Unit sign (white 63 on green rectangular background for A&SH) On starboard side of w/s and port rear bumperette). Occasionally repeated on right (starboard) front bumper for vehicles with windshield usually off or down (e.g. ambulance jeeps and airborne jeeps). 2. 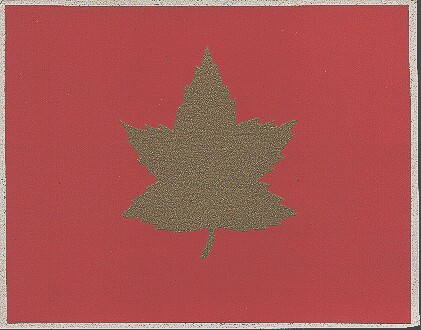 Formation Sign (4 CAD was gold maple leaf on dark green rectangle.) On front Port side and rear starboard. If no Jerrican then this sign could be on rear panel above the Ford or WILLYS name on early jeeps. 3. Convoy sign on rear differential (black 63 on white painted circle of rear dif. 4. White star (solid circle the norm, thin or thick – it varied) in circle on bonnet (hood) with odd point pointing to the rear. Circle usually falling just inside the hood rests for the w/s and overlapping the hinge, but not quite going to bas e of w/s. 5. White 6″ stars on sides, could be above steps or just behind seat cut-out or on rear corner panel. Usually painted “crooked” – Yanks liked theirs tidy and odd point up, so we naturally wanted to do it differently. 6. Gas detection patch (on right side of upper rear of bonnet – i.e. in front of passenger, just off to side of white circle & star) Dull mustard yellow. 7. Bridge sign – Usually a # 1, 2 or 5 for a jeep. 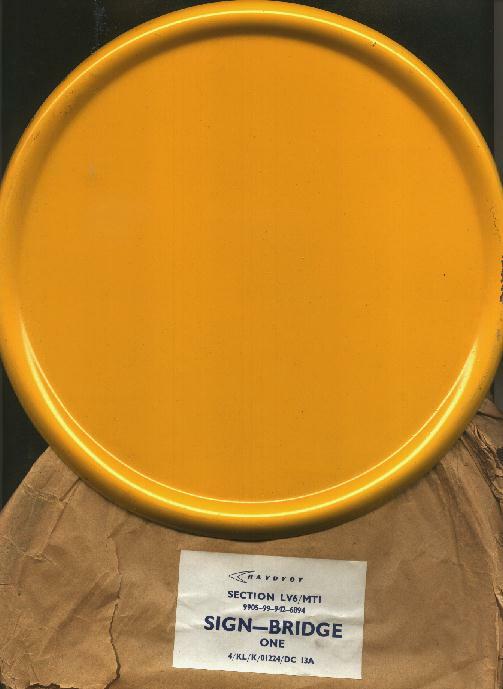 Black number on a chrome yellow plate (I have NOS British one – post war but same pattern – for sale) Sometimes mounted over right (starboard) headlight hole but for safety most drivers do later war thing of mounting it on the grille below the right headlight. 8. Tire pressure markings – NOT the US “TP” type! If used, they would sometimes just be a number (e.g. 30) or RS 30 CC 28 (for Road Surface and Cross Country). 9. War Department (WD) number. Most Canadian jeeps (not all) overseas were assigned numbers in the 4 million, 200,000 range. I suggest using CM429_ _ _ _ (total of 7 numbers after the CM – C for Canadian, M for Motor Car.) Sometimes repeated on rear – if slat grille with no Jerrican on left rear, the number split e.g. 10. Vehicle pet name – Usually in British practice was a girl. Painted in white about 1″ high at top of grille. Occasionally larger on centre of windshield panel. NOT common in Canadian Army. 11. Unit Serial Number – For A&SH it was 300/1, not always used, but if so, often on top edge of right (stbd) wing (fender) near front edge. This is a different kind of serial number to the unit serial mentioned above and co-existed. Vehicles landing on D-Day could have ship info chalked on and could have stencil on side with loading information . 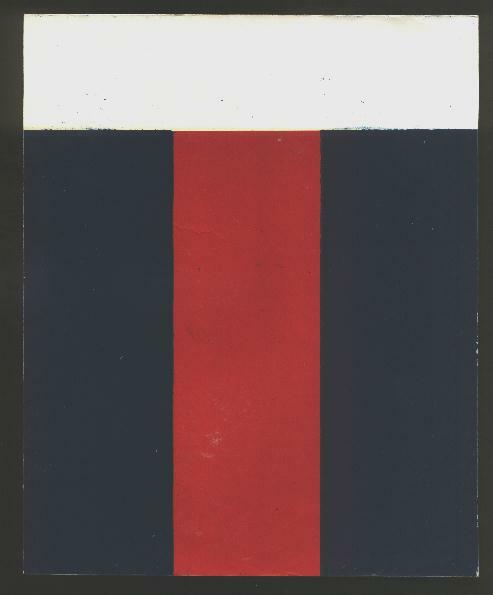 Staff car flaq for the jeep of General Harry Crerrar as General Officer Commanding, First Canadian Army, 1944-1945. This one was given to me by his Aide-de-Camp. 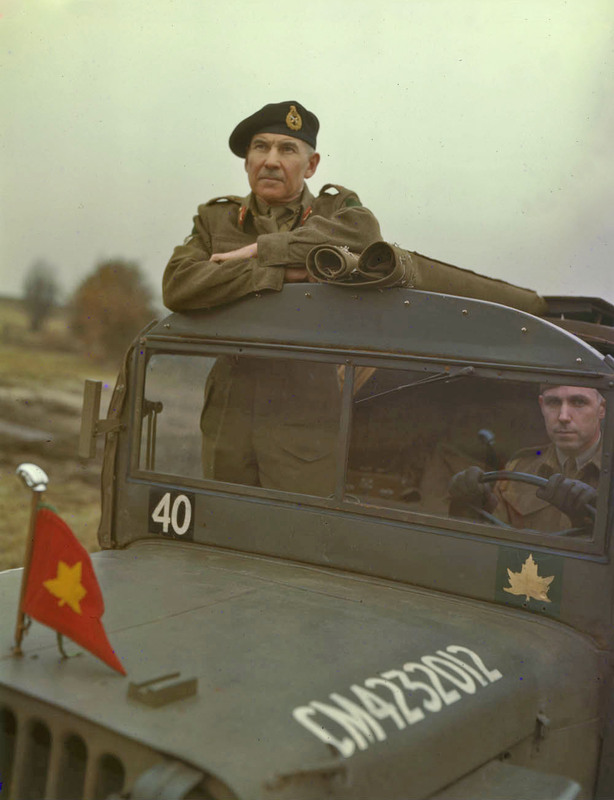 General Crerar’s jeep flag as General Officer Commanding First Canadian Army in 1944-45. His ADC, Findlay Morrison, gave it to me. I have a large collection of Canadian Army staff car flags. 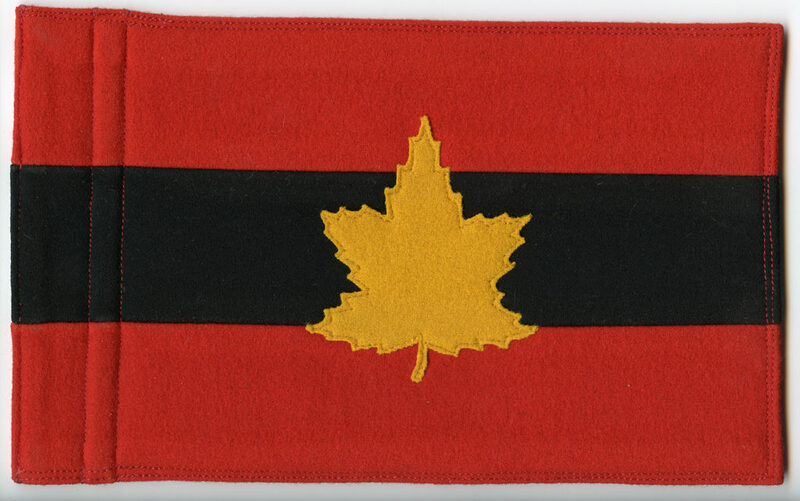 Brigadier’s pennant for the 27th Canadian Infantry Brigade which went to Germany as part of NATO. 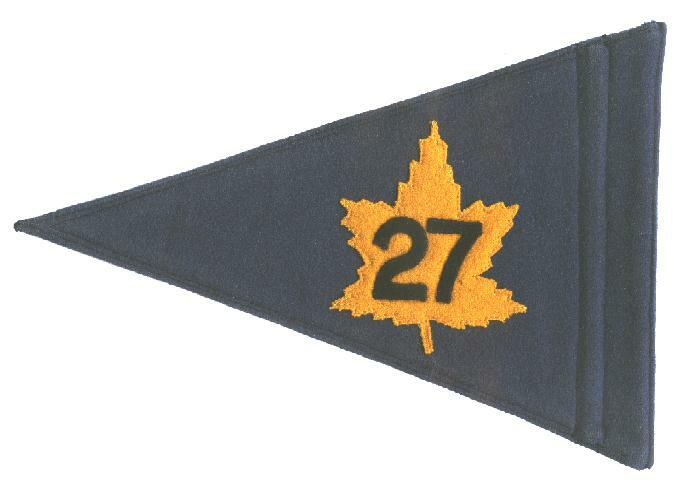 Brigadier’s pennant for 27 Cdn Bde (Militia) in Germany in the early 1950s. – Colin Stevens’ collection. The author has assembled a collection of most of the WWII military vehicle transfers used by Canadian Army overseas, and most of the pennants, swallow-tails and flags flown by senior officers of their vehicles. See my “Militaria Wanted” page for some of my wants. Canadian 6,7 & 8 Divisions formation signs. 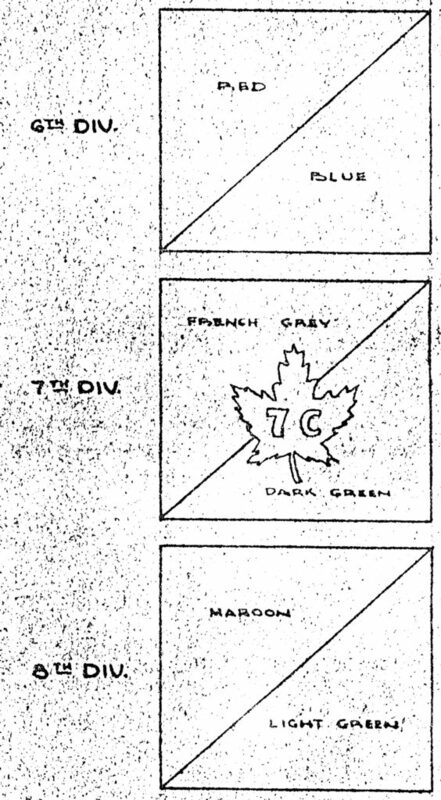 6, 7 & 8 Division formation signs from a September 11, 1944 “Vehicles markings” official Canadian Army document. Colin Stevens collection. 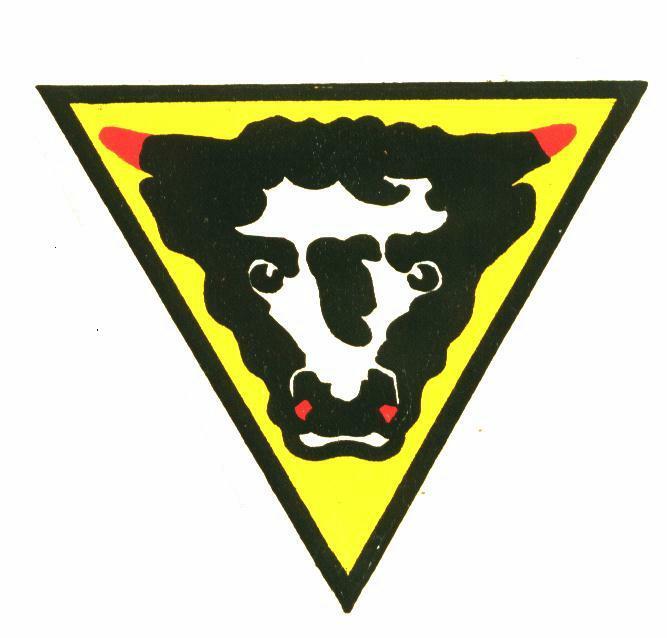 Militia District 13 (Alberta) formation sign in WWII. Showing a cowboy on a bucking bronco. M. D. 13 (Alberta & NWT in WWII) Cowboy on bucking bronco. Dark green cricle, red thin circle near outer edge. 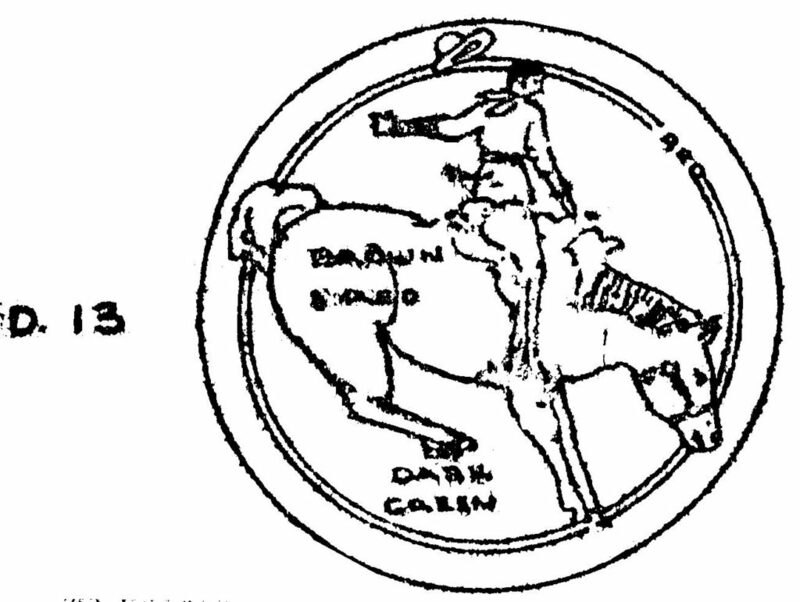 Brown and red cowboy and horse. From a September 11, 1944 “Vehicles markings” official Canadian Army document. – Colin Stevens’ collection. 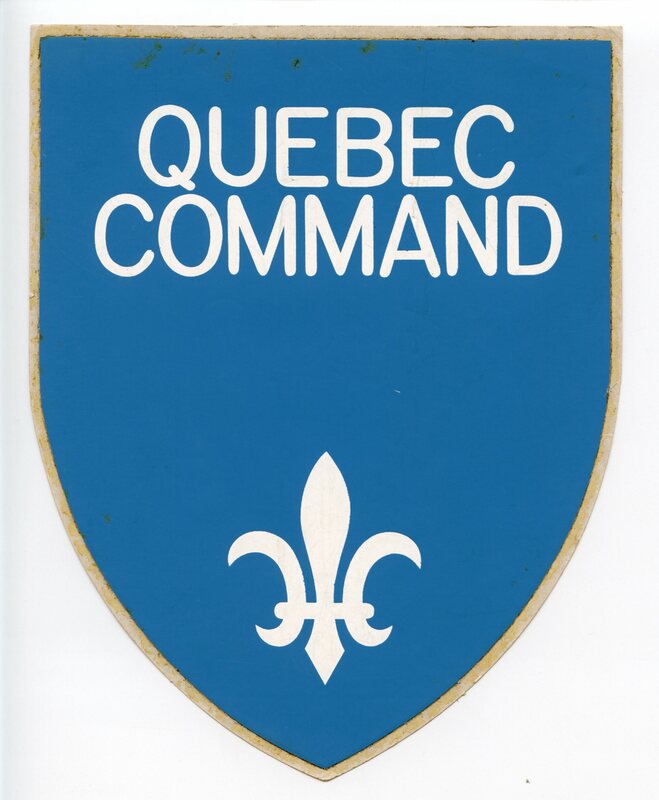 Quebec Command decal circa 1950s – 1960s. 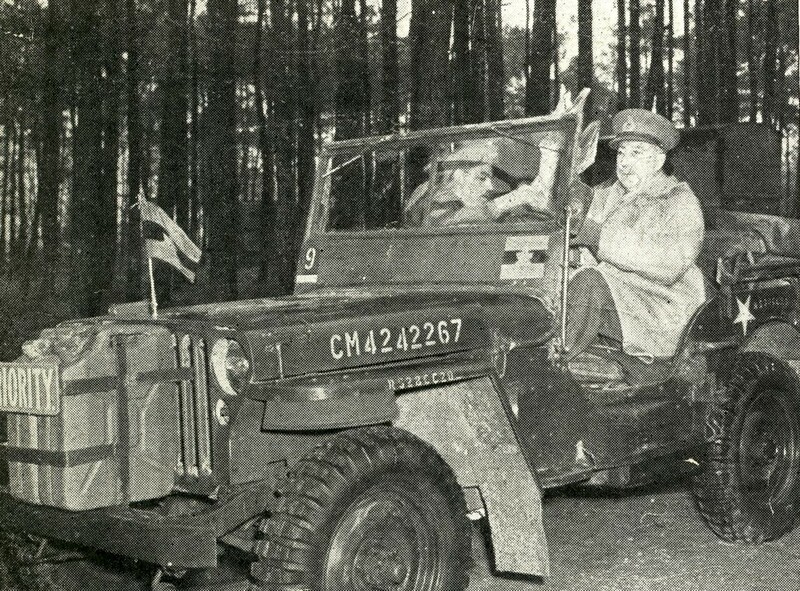 General Harry Crerar driving his jeep in 1944-1945.